This is the biggest project (although the most simple) that I've attempted, after seeing a beautiful gravel garden with several of these laid over each other step like, with hardy succulents spilling out of the center hole. 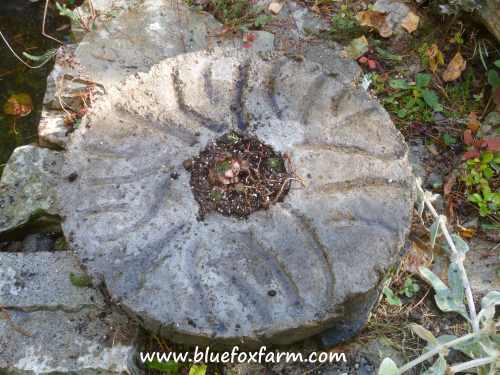 I made several of this kind of garden art piece - each one is two to three times larger than anything I've made before. I will be interested to see what this thing weighs when it's dry and cured - I may need help moving it around. The trick with something this size is to prepare a site for it in advance, and have it all ready to set it up and don't move it again. 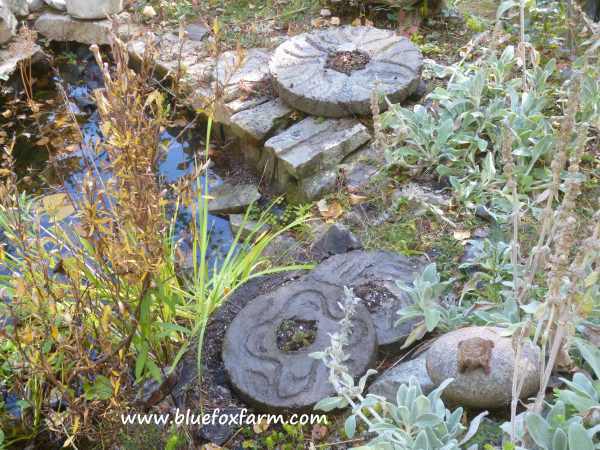 There is now a collection of them beside the ecosystem pond as a display, but they would make good stepping stones of even set into the ground upright as an edging. Isn't that fabulous? I just had to try to copy them, even though these look like the real thing, I knew that making one out of hypertufa could give it that same rustic look. 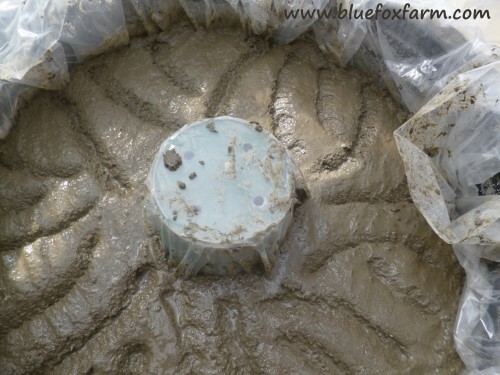 Finding the biggest round mold I had was easy - I never throw anything out. 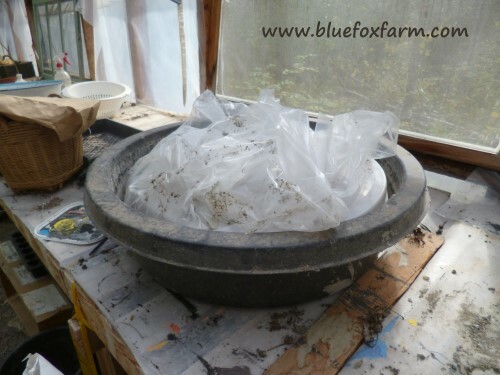 I had a big plastic pond liner, made from fairly rigid poly, so I used that, with the center hole made with a six inch plant pot. I placed the plant pot in the approximate center, and lined the whole thing with very thin poly film. This project took two large batches of my regular hypertufa recipe - a 1:1:1 ratio of peat moss, perlite and Type 10 Portland cement powder. 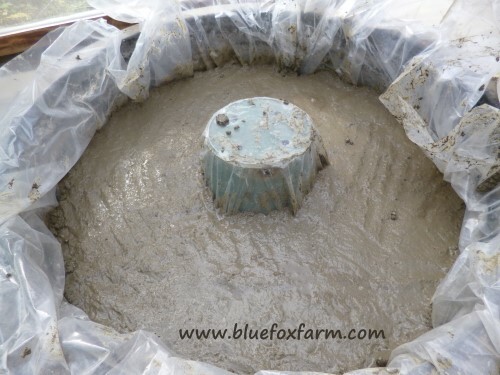 Once it was mixed, I just started in the center, so that the plant pot would stay basically in the middle, and worked out from there, filling the entire mold with handfuls of the mix. 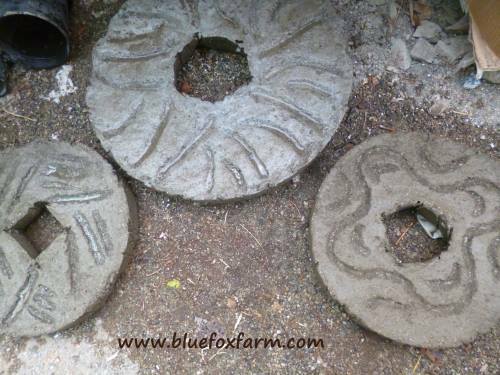 I found a picture of the different kinds of textures that millstones have - there are an astonishing array of patterns, so I made one up. I like these kinds of projects where there are no rules. I may have to go over it again, once the mix sets up a bit - maybe tomorrow. Until then, the poly film goes over the top to hold in moisture, preventing it from drying too quickly. I don't know how I will cure something this big - maybe it stays in the mold for a week or two, filled with water. 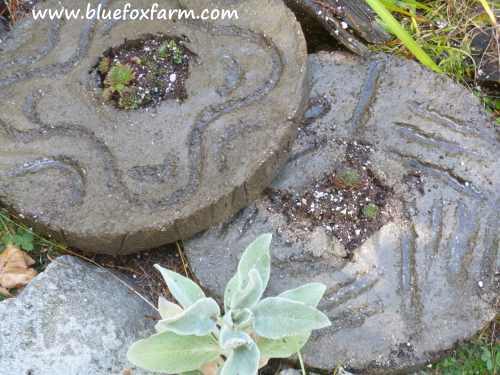 The center holes are perfect for planting with some little stonecrop and hens and chicks. 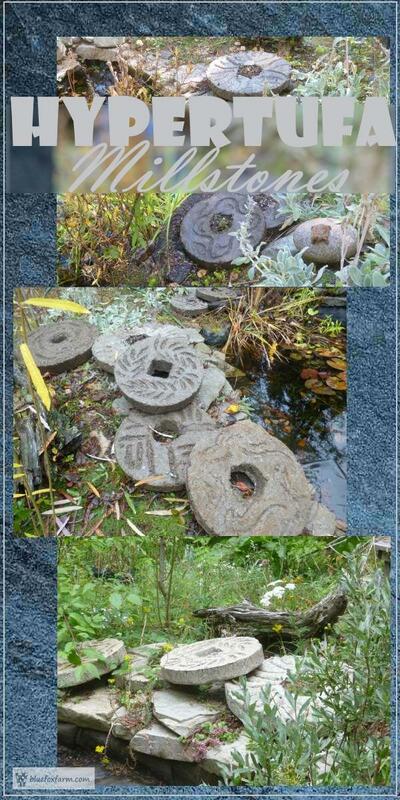 Three millstones are now in place by the pond, looking as though they've always been there. The two smaller ones are nestled together, with a few of their own hens and chicks. Hopefully, moss will soon fill in the marks and make them look really aged. Now they are in place, they'll stay here indefinitely - no pampering these crafts! The plants will fill in and hold them firmly in place. Wanna see the real thing? 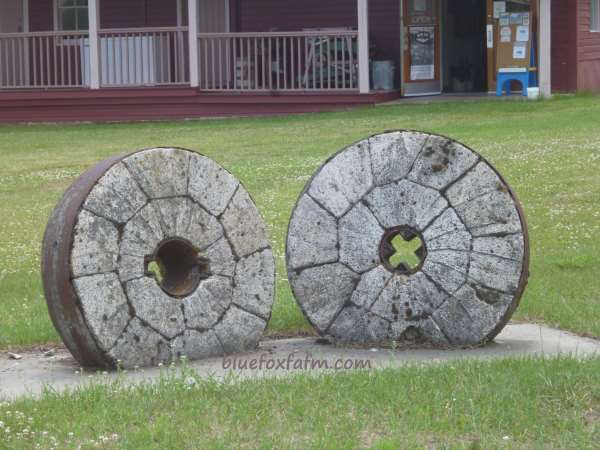 These are displayed in front of the mill (yes, a real flour mill) in Grand Forks, B.C. These are probably made of cement, not hypertufa, and they're bound around the outside with a metal band.